We recently covered Psoriasis, a chronic but less common skin condition. Dermatitis and Eczema are extremely common and although you may have heard of Eczema more it is actually a type of dermatitis! What is Dermatitis and Eczema? Dermatitis is an inflammation of the skin which usually comes up in a rash. It can be itchy, tingling or burning and come up in blisters or pustules. It affects 1 in 5 people at some point though it affects many in different ways and there are different types. There are a few different types of dermatitis, find out more about them below. 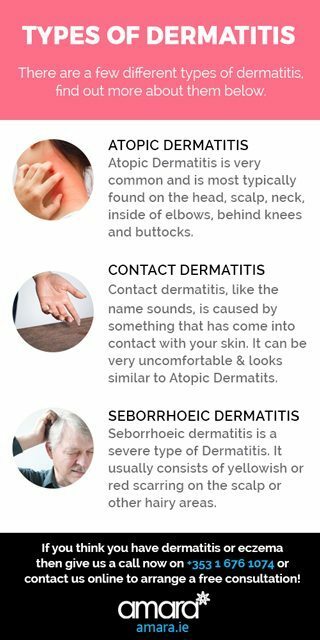 Atopic Dermatitis is very common and is most typically found on the head, scalp, neck , inside of elbows, behind knees and buttocks. It is also very common with those who suffer from asthma and/or hay fever. Atopic dermatitis can flare up at any time depending on the individual, during hayfever season it may flare up frequently! Have you ever had dry or flaky skin around a ring that commonly wear? That is likely dermatitis! Seborrhoeic dermatitis is a severe type of Dermatitis. It usually consists of yellowish or red scarring on the scalp or other hairy areas. It can also occur on the face or any creases on the body such as around the nose. This is also what is known as cradle cap on babies and can also be aggravated by stress! How do we treat Dermatitis and Eczema? First off it’s important to figure out exactly what type of Dermatitis you have. Notice when you are likely to have a flare up – do you have hay fever or sinus issues? Or is it only an allergic reaction to something that you have come into contact with? It’s best to go to your GP or a dermatologist who can tell you exactly what your issue is. Eczema sufferers are likely to be diagnosed in their childhood when it is very common. To best way to treat dermatitis is to try and prevent it and by knowing what can cause your dermatitis you can take a few steps to try prevent it or treat it more quickly when it does occur. Avoid Triggers: If you notice something’s typically caused a flare up try and avoid. Unfortunately for many sufferers almost anything can cause a flare up! For hayfever sufferers keep taking your antihistamines to try and prevent the flare ups. Creams: Typically your doctor will prescribe a steroid cream to try and stop the irritation. This will usually clear up the flare ups in about 2 weeks depending. Don’t Scratch it! : Just like Acne or spots picking at it makes it worse! Picking or scratching at the flare ups or patches can lead to scarring! So just stick to prescribed creams to calm down the itch! 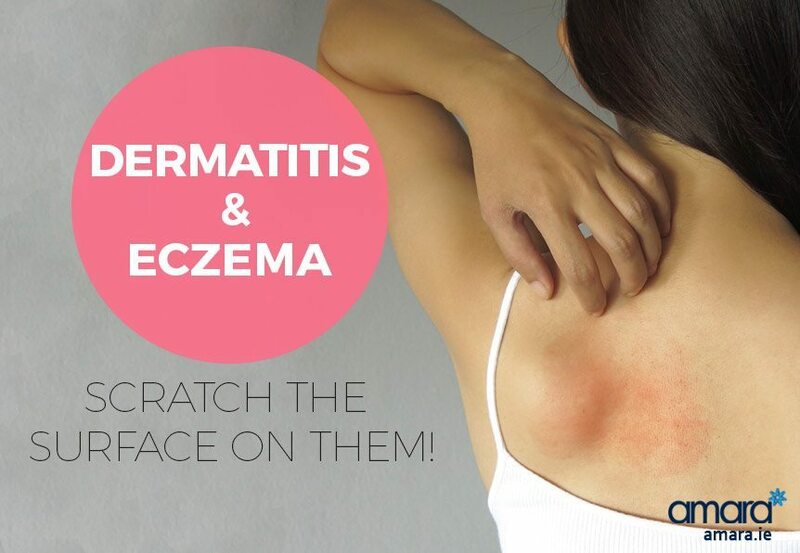 Do you suffer from Dermatitis or Eczema? If you’d like to arrange a consultation to see our skin health specialist then give us a call now on +353 1 676 1074 or contact us online! And, if you have any special tips about how you combat your flare ups then tell us below!